Ultra Tex is an acrylic breakthrough product that is pigment rich and contains no cement or plaster compounds. 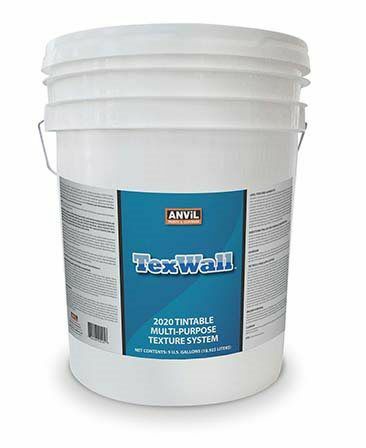 Anvil 2200 Texture Finish is designed as a single product, two-coat system that provides an ultra-tough, durable, breathable decorative commercial texture wall finish on interior walls. This makes it a favorite interior finish of architects for new construction and renovation in the hospitality industry. Anvil products have proven to be ideal for commercial projects such as hotels, apartments, restaurants and office buildings. Developed for commercial and hospitality applications, the Ultra Tex System includes three options of finishes when used with Ultra Tex 2205 Super Hard Base Color Coat: Ultra Tex 2200 Smooth Finish, 2210. Fine Aggregated Finish or the 2220 Coarse Aggregated Texture. Easy to apply, easy to clean as well as fast drying. The long life cycle makes it extremely cost-effective. Ultra Tex provides breathability and resistance to mold and mildew and is ruggedly durable - cleaning up with soap and water. ULTRA TEX 2200 KNOCK DOWN TEXTURE FINISH is designed as a single product, two-coat system that provides a ultra-tough, durable, breathable decorative commercial textured wall finish on interior walls. ULTRA TEX 2200 is an acrylic breakthrough product that is pigment rich and contains no cement or plaster compounds. ULTRA 2200 remains slightly flexible when cured thereby making it extremely resistant to cracking and chipping under the most demanding commercial/hospitality environment. ULTRA TEX 2200 color choices for the Base/Coat and splatter coat texture finish are available in a wide range of pastel to medium colors from most Color Systems or can be custom matched to project specifications. ULTRA TEX 2200 is highly permeable and is treated with fungicide to resist mildew growth on the product film. ULTRA TEX 2200 is designed for the Base/Color coat to be airless sprayed and for the texture coat to be texture pump applied to provide an Orange Peel, Splatter or Knockdown profile. ULTRA TEX 2200 KNOCK DOWN TEXTURE FINISH SYSTEM texturizing process is used on interior surfaces of drywall or masonry construction as a replacement for vinyl wallpaper. The finish produced by this product is excellent for walls in hotels, motels, offices, apartments, restaurants, health care and other high-traffic or commercial buildings. ULTRA TEX 2280 is an acrylic breakthrough product that is pigment rich and contains no cement or plaster compounds. ULTRA TEX 2280 KNOCK DOWN TEXTURE FINISH SATIN is designed as a single product, two-coat system that provides a ultra-tough, durable, breathable decorative commercial textured wall finish on interior walls. ULTRA 2280 remains slightly flexible when cured thereby making it extremely resistant to cracking and chipping under the most demanding commercial/hospitality environment. ULTRA TEX 2280 color choices for the Base/Coat and knock down texture finish are available in a wide range of pastel to medium colors from most Color Systems or can be custom matched to project specifications. ULTRA TEX 2280 is permeable and is treated with fungicide to resist mildew growth on the product film. ULTRA TEX 2280 is designed for the base/color coat to be airless sprayed and for the texture coat to be texture pump applied to provide an unlimited variety of surface profiles and texture effects. ULTRA TEX 2280 TEXTURE FINISH SYSTEM texturizing process is used on interior surfaces of drywall or masonry construction as a replacement for vinyl wallpaper. The finish produced by this product is excellent for walls in hotels, motels, offices, restaurants, health care and other high-traffic or commercial buildings. 2020 TEX WALLMULTI-PURPOSE TEXTURE SYSTEM is designed as a single product, non-aggregated, two-coat texture wall surfacing system that provides a ultra-tough, durable, breathable decorative commercial textured wall finish on interior walls and ceilings. TEX WALL is a 100% acrylic emulison breakthrough product that ideal for use in motels, hotels, apartment buildings and commercial projects. TEX WALL remains slightly flexible when cured thereby making it extremely resistant to cracking and chipping under the most demanding commercial/hospitality environment. The coating can be used to create a Level 5 Drywall Surface and as a splatter knockdown or Orange Peel finishes depending on the equipment and application technique used. TEX WALL texturizing process is used on interior surfaces of drywall or masonry construction. The finish produced is excellent for walls in hotels, motels, offices, apartments, restaurants, health care and other high-traffic or commercial buildings. TEX WALL 2080 is designed as a single product, non-aggregated, two-coat texture wall surfacing system that provides a ultra-tough, durable, breathable decorative commercial textured wall finish on interior walls and ceilings. The satin finish produced by this product is excellent for walls and ceilings in hotels, motels and commercial buildings. It is a 100% acrylic emulsion breakthrough product. It remains slightly flexible when cured making it extremely resistant to cracking and chipping. The finish produced is excellent for walls.